Photo by Scott McCloskey Wheeling Park’s Shaheed Jackson runs the ball downfield while Brooke’s Anthony Pannett (24) goes in for a tackle Thursday night. WELLSBURG — On a night when Brooke kicked off its 50th season of football by christening newly minted Paul ”Bud” Billiard Field at Brooke Memorial Stadium, it was going to take something extraordinary to ruin the celebration. Sixty-six Wheeling Park points and one Bruins first down later, the air was let out of the stadium faster than the inflatable helmet at the south end of the field goes down. 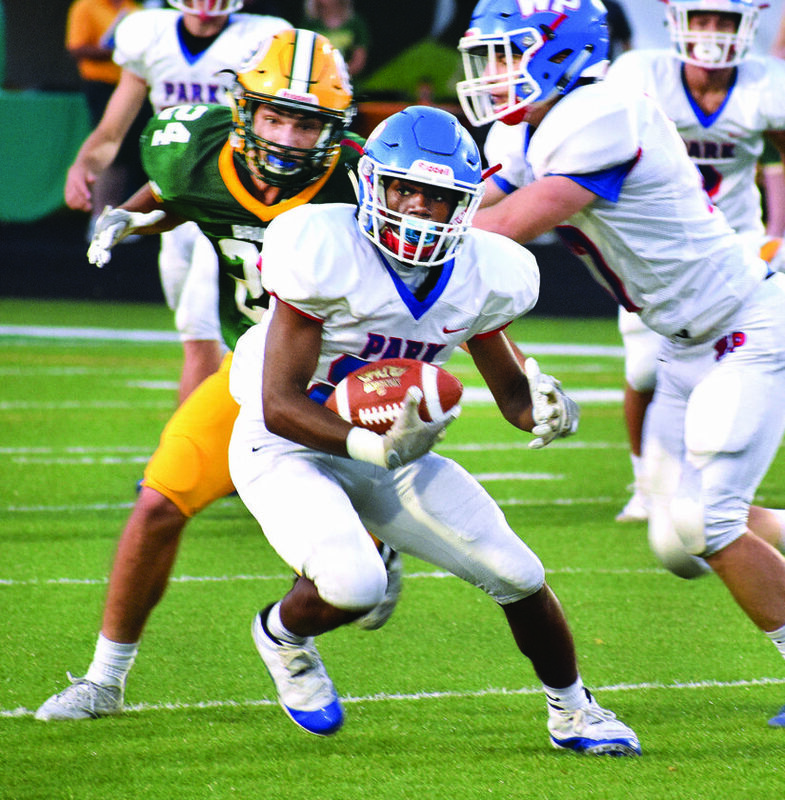 Alex Dunlevy threw for three touchdowns in his first varsity start and Rapheal Bradley rushed for 138 yards as Wheeling Park (1-0) debuted with a 66-12 thrashing of the Bruins (0-1) on Thursday night. If there was a question about the Patriots, it was how would they replace every skill player not named Jack Stakem. That was answered resoundingly. Dunlevy completed 13 of 17 — one was a spike — and threw touchdowns of 13 yards to Stakem, 39 yards to Devaughn McWhorter and 30 to Xavier Morris on the last play of the half. Bradley was joined in the rushing column by Kenya Robinson who picked up 86 yards and two touchdowns on nine carries, and Andrew Shelek came on late to add 43 yards and a score on five carries. ”We think we’ve got some players, but we knew for some of them this was going to be their first time under the lights and you never know how that’s going to go,” Park coach Chris Daugherty said. ”(It) went well for them at times but they’re going to make mistakes as we go on. The defense apparently will be, too. Wheeling Park picked off a pair of passes — Sincere Sinclair and Jaylen Rouse — while not allowing a play of more than 9 yards and limiting the Bruins to a single first down. Wheeling Park used a dizzying array of big plays to build a 25-0 halftime cushion. Stakem hauled in a TD pass to open things and Robinson went in from the 5 following an interception and big return by Sinclair, a sophomore safety. Dunlevy found McWhorter streaking down the seam for his second TD pass, this one coming on a third-and-21 play. Then came the capper, as Morris came down with his lone reception, which happened to be the play of the game. On the final snap of the half, Morris secured a diving, one-handed catch in the back of the end zone to send the Patriots into the locker room with momentum clearly in tow. ”My cornerback was beating himself up after that one, but what are you going to do? The kid made a great play,” Bruins coach Mac McLean said. ”We’re running into that same old story again where we’ve got about 50 kids on this roster and about 20 that are varsity-ready. ”We’re real young in places where we really can’t afford to be young right now and we’re running out of gas. The Patriots kept their foot down out of halftime, needing three plays to find the end zone again as Bradley broke off a 74-yarder. Brooke went three-and-out on its ensuing possession and a short punt was followed by a 17-yard Robinson TD run. On Wheeling Park’s next drive, Steven Mitchell took the first carry and went 27 yards into the end zone. Broken down simply, the game turned on the inability of Brooke’s defense to get off the field on third down and its offense not being able to stay on when given the opportunity. Brooke was 0-for-11 in those situations while Park converted 5 of 10. ”Part of that is the hallmark of a young team not being able to convert and then dropping your head for a second on a third-and-long on the other side,” McLean said. ”Park’s got the athletes that are going to make people pay if you blink. Brooke managed to avoid a shutout when on consecutive Park offensive plays, fumbles were returned for touchdowns. Anthony Pannett took the first one back 58 yards before George Makricostas went 41 with a scoop-and-score. Still, the Bruins couldn’t avoid allowing their third-most points in the history of the series. Park found the end zone three more times — a 76-yard kickoff return from Sinclair, a 56-yard punt return by Shaheed Jackson, and Shelek finished it off with a 23-yard burst. ”We’re hoping we can (wear people out) just on the fact that nobody is going two ways,” Daugherty said. ”We want to keep coming and keep coming. McLean said Max Camilletti was a bright spot when he was able to find space running the ball. The junior had a team-high 28 yards on nine carries. Brooke finished 0-for-11 on third-down conversions.